It's over! After surpassing the early 1970s' UCLA men's record 88-game winning streak by two games, the University of Connecticut women had their run of victories halted at 90 by Stanford Thursday night. 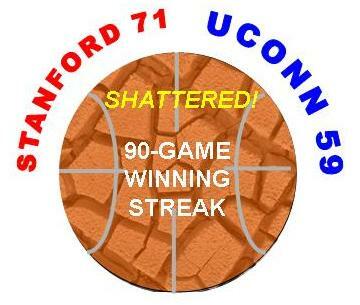 Give credit to UConn not just for the streak itself, but for scheduling tough nonconference opposition such as Stanford and Baylor. 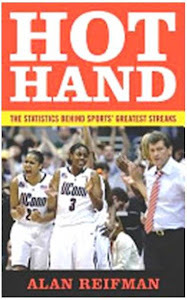 Purely by the numbers, UConn has the longest Division I basketball winning streak. However, there are other factors to consider when ranking all-time great teams, such as depth of competition (which some might argue is still not as strong in women's as in men's hoops) and the relatively recent information explosion of all-sports cable channels, the Internet, etc. (which seemingly puts contemporary athletes under greater scrutiny than in the past). See the poll question at the top of the right-hand column about where you think UConn's streak ranks in college-basketball history.